Get your own Casket!! Presenting the ghastly new WordPress theme that’s fresh from the tomb. 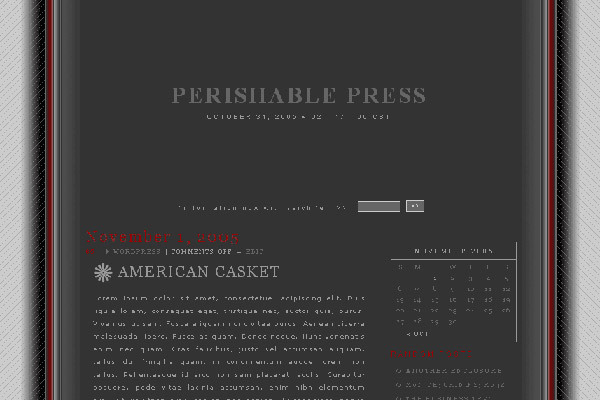 Perishable Press officially opens the casket with the free Casket WordPress theme. Casket is a meticulously designed, single-column theme that’s built with minimal code and performance in mind. This is one of my first “favorite” themes, on which I must have worked for hours, experimenting, tweaking, and fine-tuning all the details striving for that perfect layout: balanced composition, crisp icons, and some choice fonts. Casket 2.0 opened November 21st, 2005! Casket 2.0 features completely rewritten CSS and XHTML code that now validates as XHTML-Strict. So you’ll find no tables in this casket, only structural markup and presentational CSS. Plus, in addition to consolidated code, several essential improvements have been made to key casket design elements. So bury your dead, people of the world, because Casket 2.0 is open for business!